Since I’ve had a little down time before installation next month I decided to sculpt a life size clay bust of a friend of mine and fellow bronze sculptor, Bez. I still have work left to do on the backside and profile views, but it is getting there. At this stage I’m only 18 hours into the clay work which doesn’t seem like much. However, when you are focused and zeroed in on getting things as accurate as possible and constantly critiquing the likeness, 18 hours can be a long time. Usually after a sculpting session my eyes will start bugging me and can get a little blurry which means it’s time to take a break and look off into the mountains or someplace far away. Before I began the clay work I took accurate measurements from the model, such as the width from the outer edge of iris to iris, tip of nose to chin, etc. These measurements are 75% of the work right there. Once I have these important measurements for creating a convincing likeness, I take several hi quality photos making sure to keep the same distance from model to camera (about 6 feet apart) since perspective can distort how a person looks depending on how close the model is to the camera. I’ll post more pictures when he is completed. Present Arms, Marine is a 70 inch tall bronze sculpture that was designed to be installed at the entrance to American Veterans Park. 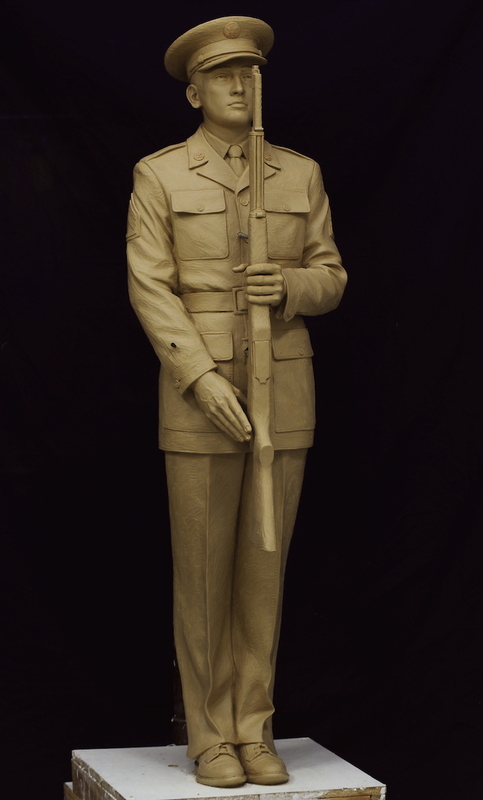 He will be positioned 20 feet opposite an Army honor guard from WWII and both sculptures will greet visitors to the park that will honor all veterans of the military and service member families, as well. Installation is set to take place late May 2018 and a formal unveiling for the new park will take place later this year. Gold star wife was designed to tell a visual story of loss. 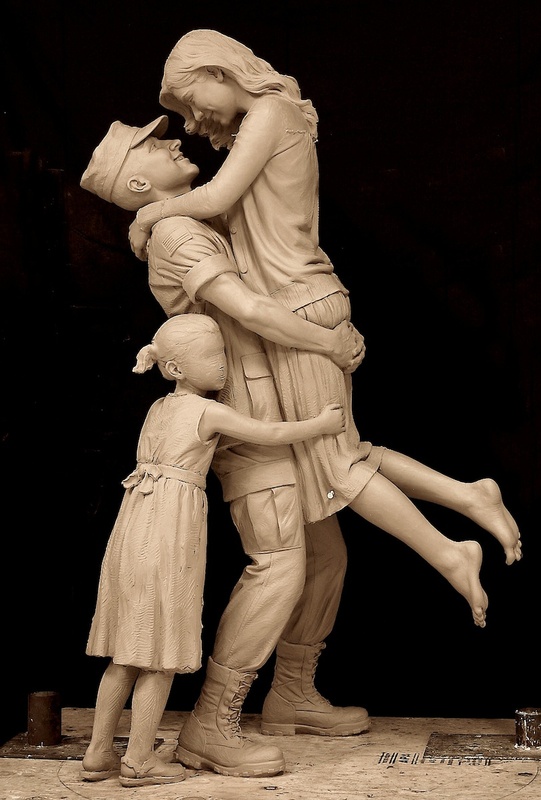 The sculpture of a grieving woman clutching a US folded flag to her chest is designed to be a partner sculpture to Returning Home (background), which shows the family of three embracing upon the husbands returning home from war. Gold Star Wife will be kneeling in front of a military headstone made of grey granite. Red poppies symbolizing remembrance will lay in front of her as though she has placed them at her late husbands grave. The two sculptures will be cast in bronze and unveiled on Gold Star Mother’s Day, September 30, 2018. This recently completed sculpture Remembering the Fallen will be installed at Fremont, Nebraska Veterans Memorial Park in May 2018. The life size bronze sculpture depicts a modern day soldier (in particular a US Marine during the early to mid- 2000’s) holding a folded U.S. flag and was designed to reflect the city’s unique way of remembering our fallen soldiers. Every year “Avenue of Flags” (a local organization in Fremont) lines up hundreds of U.S. flags along Military Ave. to honor those who served. The event is held every year on Memorial Day, Flag day, Fourth of July, Labor Day and Veterans Day. These flags are significant because each of them has been, at one point, draped over the casket of a veteran and each one therefore represents a veteran who served through many different American wars. It is a patriotic and unique way that the city honors our veterans. 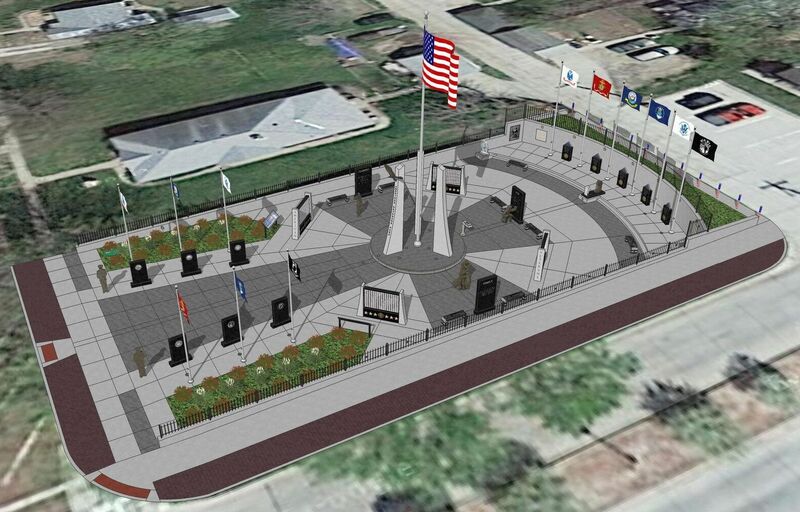 Fremont’s Veterans Memorial Park will be located along Military Ave and construction is expected to be completed in the next few months. The park was designed by West Point Monument and I was commissioned to create the bronze sculpture that will help connect the Avenue of Flags ceremonies and the new Veterans Memorial park. As I’ve written about on previous blog posts, I’m creating the sculptures for American Veterans Park that will have 8 of my bronze statues and 2 large scale aluminum reliefs installed in this beautifully designed veterans park designed to honor the brave men and women who have served our country. I began work on the sculptures the day after I returned from my trip to Europe and have been going non-stop since, now more than half-way completed. I am currently working on, what I believe, will be one of my finest sculptures called Gold Star Wife. 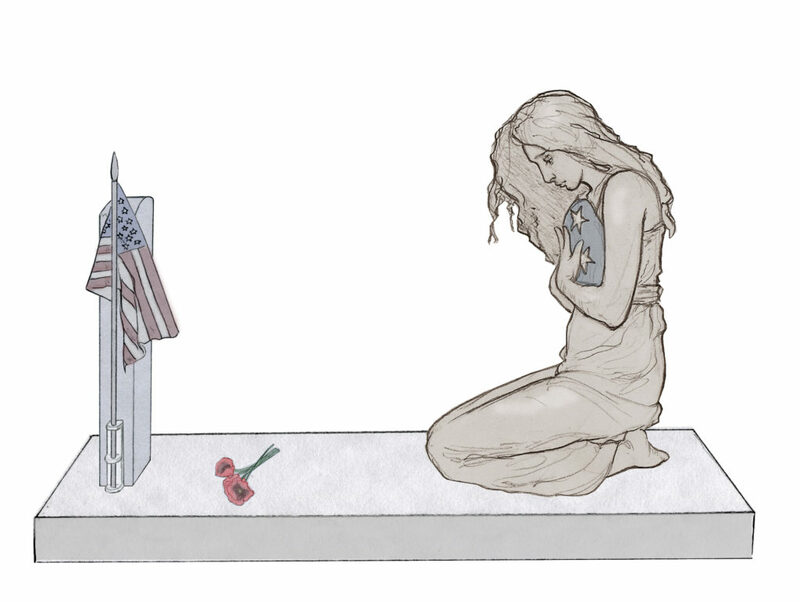 She is clutching a folded flag and kneeling at her late husband’s military grave marker. She has just laid down red poppies, which are a symbol of remembrance. On the backside of the grey granite marker will read “One nation under God: The strength of our nation is our military. The strength of our military is our soldiers. The strength of our soldiers is our families. We recognize that no one has given more for our nation than the families of our fallen.” All ten sculptures will be finished and unveiled on Veterans Day 2018. Next week will be the patina application at Art Castings of Colorado for this sculpture Remembering the Fallen. 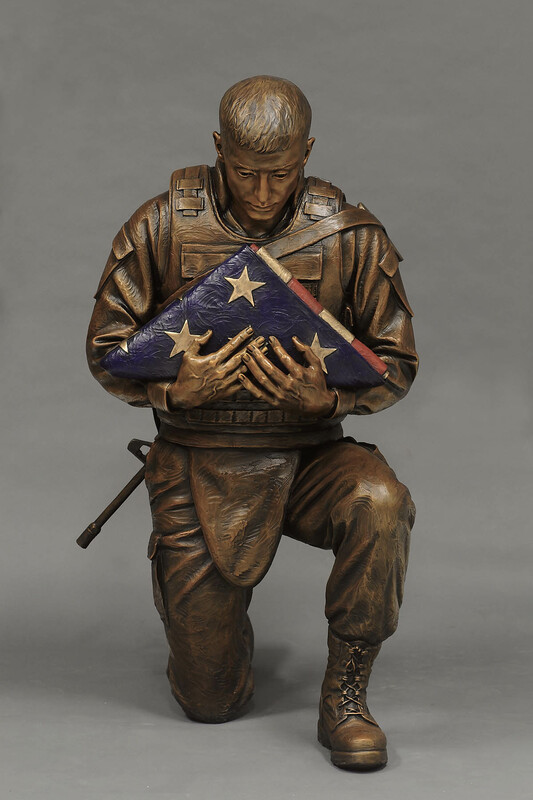 The life size bronze sculpture was commissioned for Fremont, Nebraska’s Veterans Memorial Park and it will be permanently installed and unveiled on Memorial Day 2018. The sculpture is a US Marine holding a folded flag and is designed to honor our fallen brothers and sisters who made the ultimate sacrifice for our freedoms. The soldier will be kneeling in front of a fallen soldier battle cross. I rarely like to show works in progress let alone proposals I’ve made before actually sculpting them. However, this one is one I have been looking forward to since July 2017 when I made this drawing and I am FINALLY beginning work on her so I figure why not show the concept. The life size bronze sculpture will be called Gold Star Wife and will be, what I hope, a poignant tribute to sacrifice when visiting American Veterans Park in eastern Nebraska. 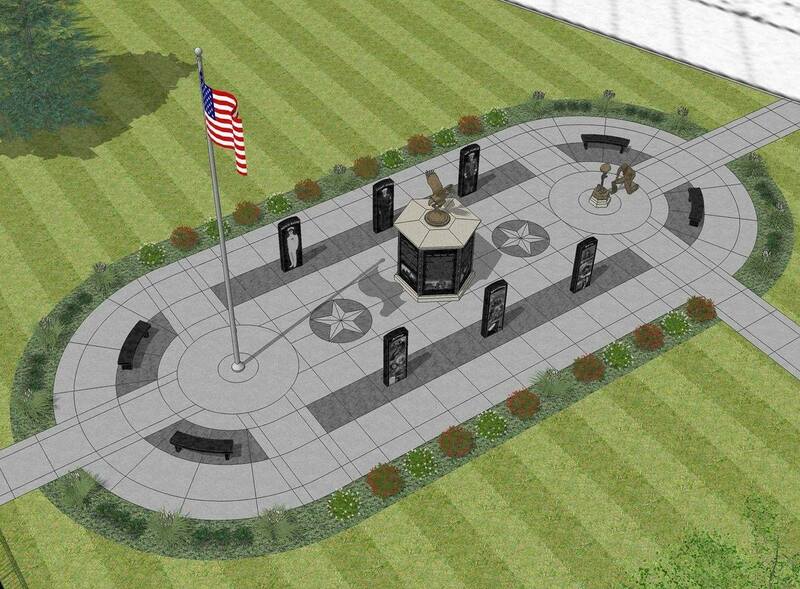 The 1/4 acre park will honor veterans and their families of the U.S. Armed Forces; the Air Force, Army, Coast Guard, Marine Corp and Navy paying respect to God, Country and Family. Towards the backside (east end) will be a section for remembering the fallen. Five folded flags will be atop five black granite columns with inscriptions etched into the granite. Just in front of this section will be Gold Star Wife holding a folded flag kneeling in front of her husbands military grave marker. She has just laid down poppy flowers which are a symbol of remembrance since the first world war. 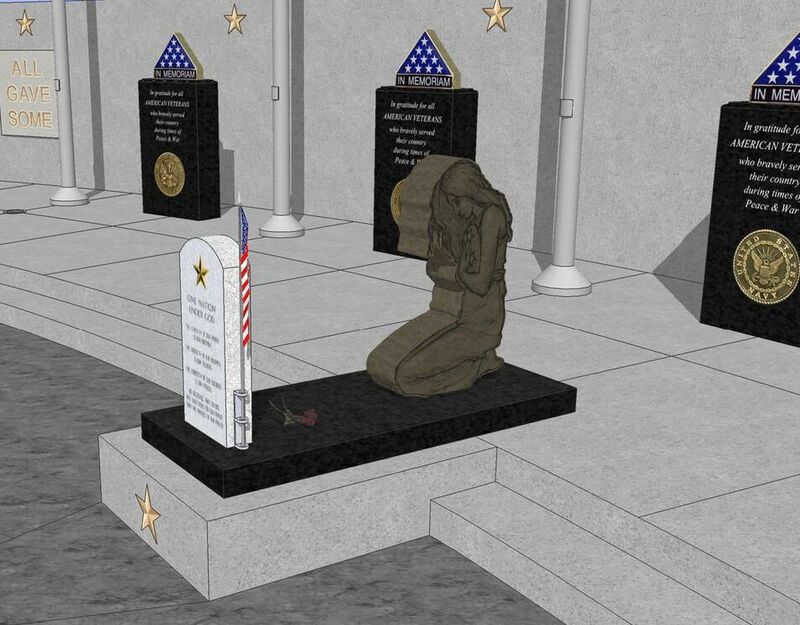 The soldiers headstone and bronze sculpture will be permanently installed on a black granite base and the monument is designed to remember those who have fallen while serving our country. The grieving woman in Gold Star Wife will be the same woman from my sculpture Returning Home (which was finished last week in clay) and both will be located 30 or so feet apart from each other attempting to illustrate those who made the ultimate sacrifice. Although the two sculptures will not be assembled as one composition, the connection between the two will be one that viewers will make themselves when walking through the park. The separation will be symbolic of the separation the woman feels in her heart for her late husband, a man who served our country and paid the ultimate sacrifice. 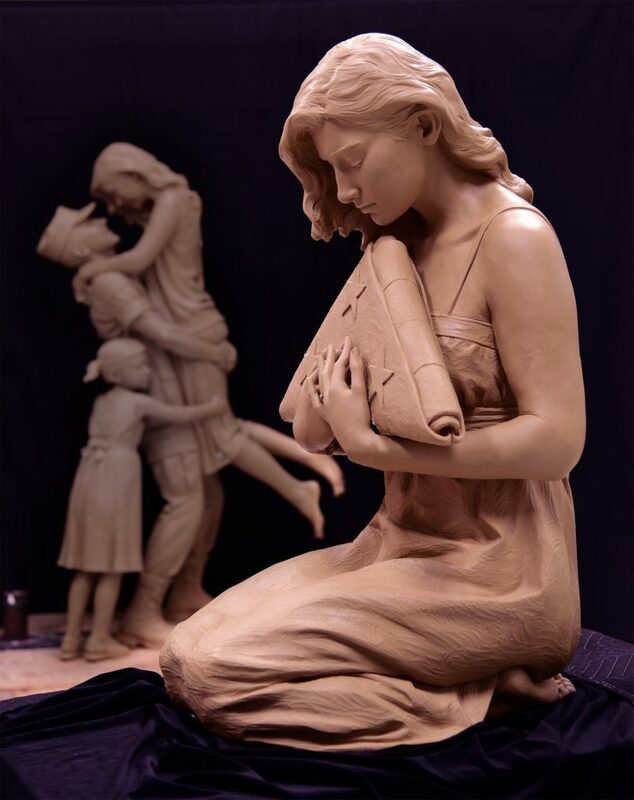 The two bronze sculptures will be unveiled on Gold Star Mother’s Day, September 30, 2018 in West Point, Nebraska. 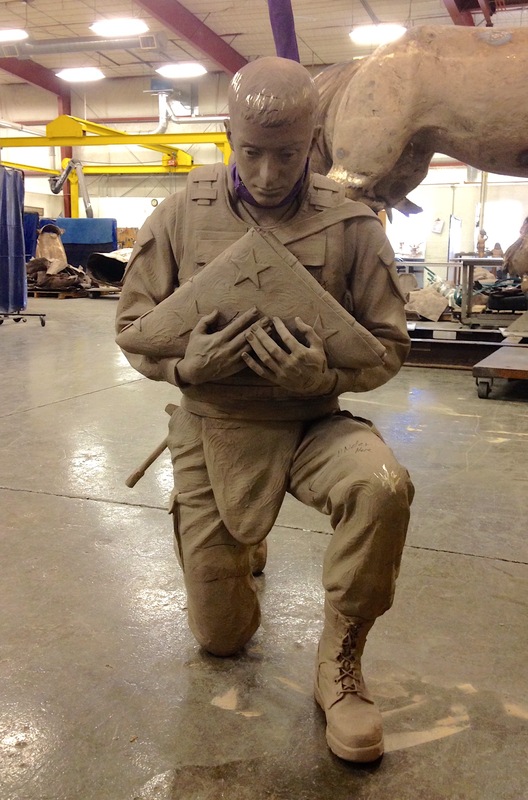 life size sculpture proposal of a Gold Star Wife holding a folded flag and grieving for her husband. One of the most enjoyable aspects of being a bronze figure sculptor is getting to sculpt hands. They take a close 2nd to sculpting a face but what I like most about them is that, like a face, there are so many types of hands. This makes it fun to try to develop character and with the seemingly endless possibilities for gesture and expression hands can be the icing on the cake in a bronze sculpture composition if they are treated well. 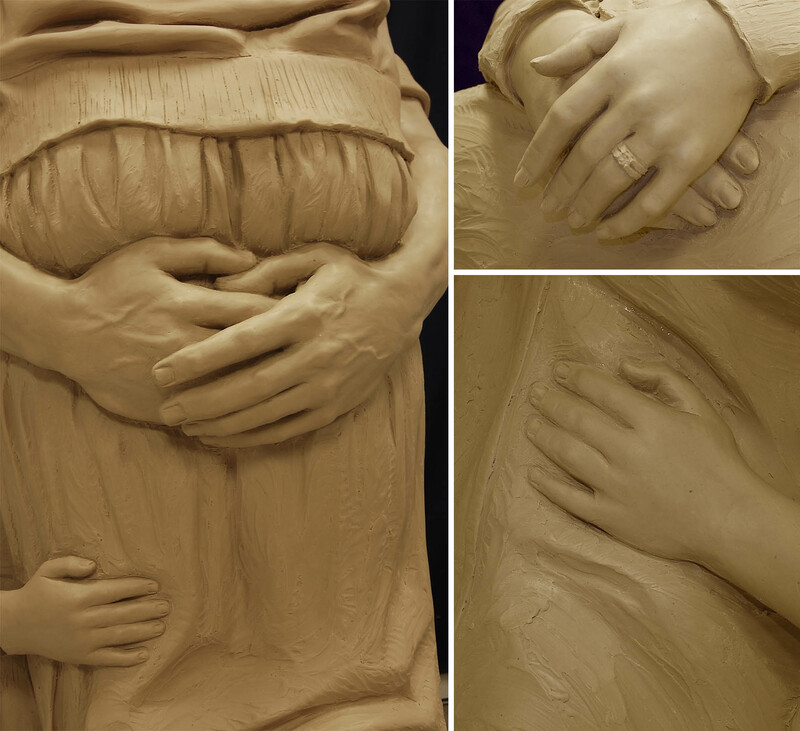 The collection of hands in this triphoto compilation are 6 hands from my sculpture Returning Home which depicts a husband returning home from war and hugging his wife and little girl. 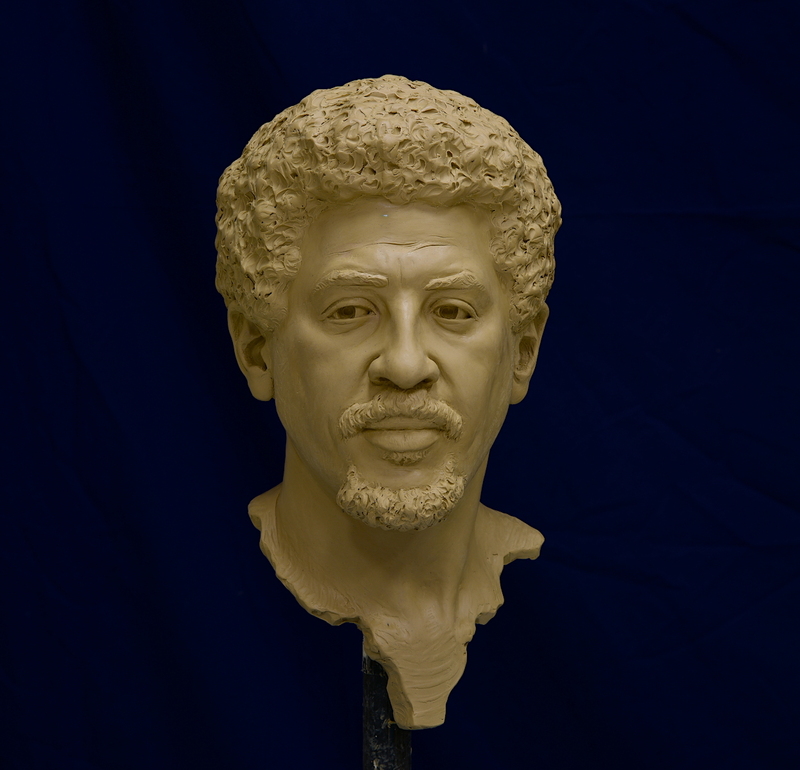 The sculpture will be cast in bronze and installed later this year at a Veterans Park in eastern Nebraska. As we close out 2017 I can’t help but feel grateful for all that has happened this past year. In the spring I visited Germany and France with my family. I got to visit the Louvre for the first time which was the highlight of my trip. I also got to visit the Rodin museum hotel Biron which had many of Rodin’s sculptures and where Rodin himself lived for the last 9 years or so of his life. As soon as I returned to the states I immediately began work on several life size sculptures some of which were installed last month for Norfolk Veterans Home, Heroes Park in Nebraska. My mom, aunt and step dad were able to attend the celebration/unveiling which included a fly over. It was such an honorable yet humble experience to see so many people take part in honoring the veterans of the Korean War memorial and the WWII memorial that these sculptures represented, despite the frigid cold weather of eastern Nebraska. The families that I worked with for the two sculptures expressed to me their gratitude for the work I did in creating the sculptures and for putting my heart and soul into them. This year has been a busy year having sculpted 7 life size monuments, as well as various other smaller projects. One of these monuments I worked on is a three figure composition of a military family called Returning Home. 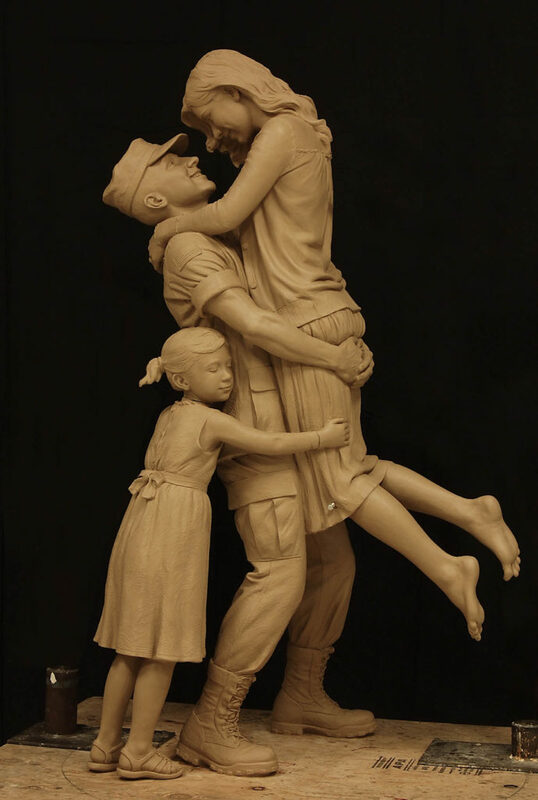 The sculpture composition depicts a husband returning home from war and greeting his wife and child and will be cast in bronze and installed in 2018 at American Veterans Park in West Point, Nebraska. The latest life size clay sculpture is this US Army Honor Guard that will be cast in bronze and permanently installed about 30 feet from the US Marine Honor Guard (completed a couple of months ago) for a Veterans park in Nebraska. Since I had sculpted the first Honor Guard in the exact same pose I was able to modify the clay for this sculpture without having to tear off the clay from the armature. 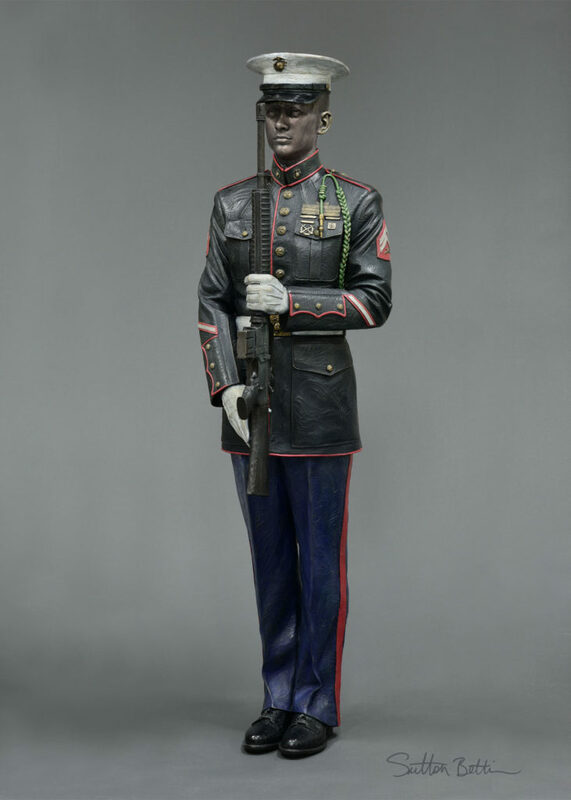 This sculpture is a WWII era honor guard and it was interesting noting the differences in how they used to wear their uniforms back in the 1940’s. I particularly like the slight tilt of the cap that seemed to be common in the military back then.